Do you enjoy Indian food? Most of us in the UK love it, making it so popular it has almost become our national food. Indian food is really unlike any European cuisine and you experience an outburst of flavours with just one small bite. If you are looking for exceptional Indian food in the Midlands, August’s Partner of the Month might just be your best bet. Maazi Indian Restaurant is offering a prize that will make your mouth water instantly. 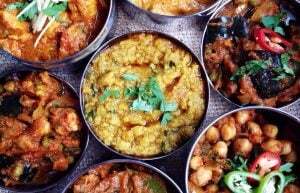 Whether you want Indian food catered at an event you are organising in order to make it stand out or you just feel like something spicy on a cold evening, Maazi Indian Restaurant is the ideal choice. You can also take advantage of the prize by taking your loved ones out for dinner at any of their 3 Midlands locations. With fantastic service and affordable prices, Maazi will surely leave you satisfied. Their newest site – Maazi Leek is situated inside an old textile mill and reflects a blend of its original features as well as South Asian influences. 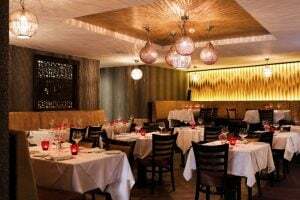 This truly gives this restaurant a unique ambience and an edge over other restaurants as Indian food in the Midlands is widely common. Since their staff and chefs have years of experience, you will be served the best Indian food in the Midlands! The aromatic curries served in the traditional aluminium pots will give you a truly authentic Indian feel. If you are organising an event in one of our Party Houses in the Midlands, you can ask Maazi to cater for you and your guests. You can expect delicious food along with a successful and comfortable party at one of our houses. Maazi has been providing catering and free delivery services to Party Houses for years. It always adds a unique touch to events celebrated in our Party Houses. Maazi is known to provide excellent food and service, attempting to deliver more than what is expected of them. The menu choice is enormous so for the ones who cannot handle too much spice, there is always an alternative. Maazi Indian restaurant is offering a wonderful prize for the winner in the form of a £70 voucher. This can be used for both dining in or takeaway. Additionally, they are offering a free pick up and drop off service in the signature Indian Tuk Tuk, providing you with a lovely Indian feel. Do not miss out on winning this generous voucher for the best Indian food in the Midlands! In order to win, all you have to do is sign up below. Fill in your details and enjoy a hot and spicy traditional Indian meal! Sign up to Party Houses Newsletter and receive great last minute offers, be first to know about new Party Houses and compete in our wonderful monthly competitions!